Did you go to one of the APS schools? If so I might know it, my school often competed against Melbourne APS schools in sport. What is a APS school? I just went to a regular public high school. My school wasn't apart of anything like that. They couldn't organise a cup of cofee let alone a whole day of activities. Consider yourself lucky! I loved my school but being forced to spend every Saturday driving up to Melbourne and back, often taking most of the day was awful! We sometimes had to leave as early as 5:30 or 6am . I actually much prefer the shorter cut. I think some of Mathilda's "training" feels over the top and poorly paced. Pacing...? Maybe. But the scenes are crucial to actual understand the character's development. I feel the opposite. With more training, she should have understood her attempt was futile. I always liked the idea that simple Leon wasn't actually trying to train her properly, he just wanted an excuse to keep her around. To actually take her on a proper job with him just felt like a step too far for me. I feel the opposite. With more training, she should have understood her attempt was futile. I always liked the idea that simple Leon wasn't actually trying to train her properly, he just wanted an excuse to keep her around. Still my same point (not trying to cxonvince you). At least it explains why she thinks shed can do it, even she wasn't trained enough to actually do it. Hit-Girl she is not. To actually take her on a proper job with him just felt like a step too far for me. Neither version say he actually did that. He very much knew his job was dangerous, which made him setting things up so she would inherit his wealth (which he didn't care about anyway). It's a while since I saw it, but wasn't the guy in the apartment a real mark? I must watch this again soon anyway. The drug dealer...? I forgot about that one. I remember the runner in the park was shot with paintball bullets. I too must rewatch this (extended cut, of course ). Maybe Friday...? I watched Lėon yesterday and it's still an amazing film. I laughed, I cheered and I cried. Natalie Portman is wonderful as Matilda and Gary Oldman is buckets of fun to watch. Danny Aiello' character is still as shady as ever. So, it appears the guy in the apartment was a real mark, but he gets killed by Léon after Matilda is done shooting her paint bullets at him. Then comes the dinner scene followed by a whole montage of them working together, taking out at least 10 targets. However, during the montage no actual kills are shown and we never see Matilda shoot at a human with real bullets. The added restaurant scene (and others where Matilda expresses her love to Léon) have always been more controversial, I think. The restaurant scene itself, where she gets drunk even, could be dropped, but then we'd miss this wonderful moment of Matilda laughing. Audrey Hepburn's Oscar®-winning performance in her first starring role. Roman Holiday was nominated for ten Academy Awards®, and Audrey Hepburn captured an Oscar® for her portrayal of a modern-day princess rebelling against her royal obligations who explores Rome on her own. She meets Gregory Peck, an American newspaperman who, seeking an exclusive story, pretends ignorance of her true identity. But his plan falters as they fall in love. Eddie Albert contributes to the fun as Peck's carefree cameraman pal. Stylishly directed by William Wyler, this romantic comedy ranks as one of the most enjoyable films of all times. A great movie. Always fun to watch. And the two hours running time fly by fast. Audrey Hepburn has deserved her Oscar for her work here. Even though it has been over ten years since I have been to Rome and the movie being almost 50 years old, it is still nice to recognize a lot of the locations used in the film as places I have personally visited. A shy amateur photographer Makoto (Tamaki Hiroshi) and endearing Shizuru (Miyazaki Aoi) meet each other at university. The two often go to a forest together to take photographs. Shizuru secretly loves Makoto, but he only has eyes for another girl. After Shizuru asks Makoto to kiss her in the forest to create the perfect picture, Shizuru disappears! A wonderful movie. Aoi Miyazaki, who I know as one of the leads from the movie "NANA", is great and really adorable as the child-like Shizuru. I enjoyed the movie throughout. Although I have to admit I was thrown by the ending. Even though I should have expected it, as it is categorized as a romantic drama and not a romantic comedy. It has a bittersweet ending. Often the only difference between a romantic comedy and a drama is, that a comedy has a happy ending and in a drama, one of the couple has to die. It fits here and works with the rest of the movie. But a side of me just wanted to have them happily ever after. Reminds me of the point of the movie "Stranger Than Fiction". Hana (Anne Suzuki) and Alice (Yu Aoi) are childhood friends. Alice is unrestrained and free-spirited. Hana is always picking up the pieces as a result of it. But there are good things that Alice brings too, like Hana's first ever crush. Even though it is fairly long and slow-moving, I quite enjoyed it. The most fun was how Hana and Alice convinced the guy he has amnesia and just forgot about their relationships. I would have liked to see more of how they resolved the situation with the guy after he found out that he really didn't have amnesia. 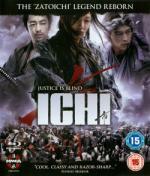 Ichi (Haruka Ayase) is a blind minstrel searching Japan for her childhood mentor: a master of the martial arts. In a town beset by bandits, she comes to rescue Toma (Takao Osawa), a samurai unable to use his own sword. Refusing to believe that a blind woman was his saviour, the townsfolk want Toma as a lawman, and the bandits want him dead. Ichi is their only hope for survial... she may be blind, but darkness is her ally. This is a sequel to Zatoichi. I enjoyed it more than its predecessor. It stars Haruka Ayase ("Cyborg She") as the blind swordswoman. At times a little dull, it is overall worth a watch. It was great to finally have a chance to see this movie with a good picture quality. It benefits a lot because of all the great and colorful dance numbers. This movie is one of the most well-known modern Bollywood productions. Deservingly so. Most Bollywood productions have song and dance numbers in it, but they usually are more or less thrown in. This movie is one of the few I would call a real musical. I had forgotten how much singing is in this one. Almost the complete movie is in songs. All of which further the story. This is one of the longest Bollywood movies I own (only beaten by a few minutes by "What's Your Rashee", "Lagaan" and "Jodhaa Akbar"), but it never gets boring for a minute, even now after I watched it for the fourth time. On Blu-ray I could enjoy it more than I did the DVD version, whose picture quality greatly suffered from having a 3.5 hour movie pressed on one DVD. I don't regret my first real Blu-ray double-dip. And as a bonus I have all the extras which were originally part of the two-disc DVD release (I only had the single-disc release).